Henry has been tying flies since 1955. Since then he received the 1994 FFF’s Lee Wulff award for genetically producing the super grade hackle he started in 1965. In 1990 Henry started designing flies with rooster soft hackle, knee hackle and chickabou. The Oregon Council of the FFF made him their 2000 Fly Tyer of the Year. 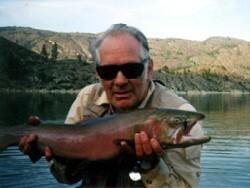 Henry is pictured above with a 28 inch Lahontan Cutthroat trout caught and released at a lake in Washington State. Fly used: His Purple Chickabugger. Hook: Daiichi 2220 size 6.